A new family of banknotes has today begun to circulate, issued by the Central Bank of Madagascar with the addition of a new high value denomination. Today, Madagascar banknote denominations of 2,000, 5,000, 10,000 and a brand new high value denomination of 20,000 Ariary (US $6.80) have been issued into circulation. The remaining 100, 200, 500 and 1,000 Ariary denominations will be issued on 18 September 2017. The new banknotes replace the current family which has been circulating throughout the country for more than ten years. 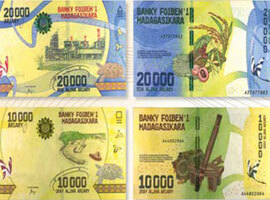 The main theme of the new banknotes is “The riches of Madagascar”. The Central Bank advises that they include a variety of modern security features aimed at reducing the risk of counterfeiting. Security features include a 3D optically variable ink feature, a perfect register ‘see-through’ feature, a colour changing windowed security thread, watermark, microtext and latent image features. Radio and Video: Available to view on the Central Bank’s website. New high value banknote joins the next series from Madagascar, click here to view.